How Do You Turn A Monkey Into A Therapist? In the 1960s, Harry Harlow made headlines when he revealed the experiments he done on rhesus monkey infants. He’d raised infants in isolation, with one “mother” which was made of wire but dispensed milk and one foodless but cuddle-friendly mother made of terry cloth. The infant monkeys clung to the comforting mothers, even though they went hungry. He also raised monkeys in a “pit of despair.” This steel box gave them no social contact and no stimulus. Eventually the monkeys simply huddled in on themselves, unable to do anything but rock back and forth. Few people know about Harlow’s further experiments, in which he tried to see what would bring the monkeys back from this kind of extreme depression. He exposed these isolated monkeys to different social groups and saw how they developed. Six-month-old isolated monkeys exposed to normal six-month-old monkeys did improve but never really caught up. When the isolates were thrown together in groups, they managed to work up a basic set of interactions, but also showed little improvement. Exposing isolated females to infants occasionally elicited maternal behavior, but it wasn’t very good maternal behavior and it didn’t come with any other social skills. One group of isolates, however, showed total or near-total recovery. These six-month-old monkeys were exposed to “therapist monkeys.” Rather than being older or the same age as the isolates, the therapists were three-month-olds who had been raised by nurses and had had regular contact with other monkeys their own age. During the first encounters with the therapists, the isolates simply curled in on themselves. The therapists (who were still infants and used to clinging mother-figures), clung to the isolates. After a few sessions, the isolates clung back. Once the isolates were used to one therapist monkey, they were allowed into the therapists’ group play situations. 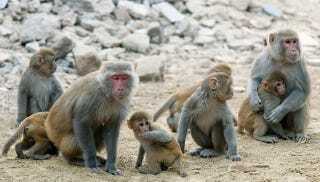 Gradually, Harlow increased the isolates’ social contact and group time. At the end of six months, the isolates were pretty much at the level of the therapists. Neither group engaged in huddling or rocking behaviors anymore. The monkeys that were in “despair,” had become normal monkeys.